“Belgium has some of the best chefs in the world and its cuisine is among the best in the world. But there is no one who has said it before. In France, gastronomy is part of their culture, they say it is part of their patrimony. When the French go abroad they say that they are ambassadors of gastronomy,” says Peter Goossens in an interview with Food and Wine Gazette. 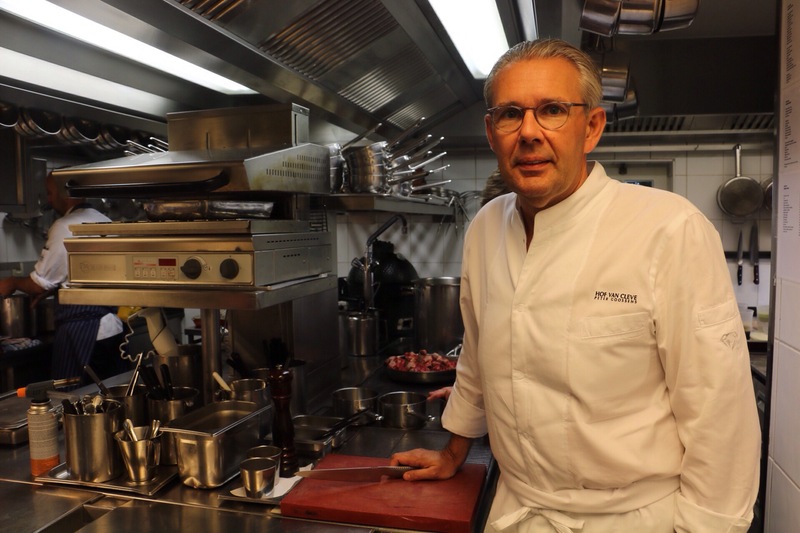 Goossens, chef of top Belgian restaurant Hof van Cleve, is probably Belgium’s most internationally known chef. And rightly so given the list of awards he holds. He’s been awarded the highest achievements in all the top guides, has got near perfect scores for his cooking and has been representing Belgium in the World’s 50 Best Restaurants since 2006 (this year he slipped out of the top 50 places for the first time) but still holds three Michelin stars and a near perfect score in the Gault Millau guide (19.5 out of 20). So when Goossens speaks, you need to take note of what he is saying because on top of the talent, he has the experience and the knowledge to back it. I ask him why he thinks that Belgian cuisine is not really known internationally unlike say the cuisine of Scandinavia which has been in vogue for the past years. Belgium should promote itself as a culinary destination but this has not yet happened. He tells me that of course France has an advantage over Belgium because of its size. “The country is so much bigger. They have a lot of things which we don’t have. They have the Atlantic coast, mountains and the Mediterranean. But Belgium, as a small country has great produce, exceptional vegetables and great artisans in various fields. What we need is for the government to push Belgium’s image abroad. Can you imagine, in Belgium we have the frites but they are called French fries worldwide. It is a bit mad to have allowed this to happen,” he said. It is a question of promotion and marketing. And indeed he has a point. Belgium is known for its chocolate, mussels, the Manneken Pis and more recently its national football team, or Red Devils as they are known, but no one speaks about its cuisine. “Out government needs to do something about this because food is part of our identity. The tourism office in Flanders created a film two years ago but more needs to be done. You need to push for many years for it to be successful but it is not difficult when you have exceptional restaurants and great artisans,” the Belgian chef says. Peter has been at the pinnacle of Belgian cuisine for many years now. One of just three, three Michelin star chefs, he opened his restaurant in 1992. By 1994, he had his first Michelin star. He was awarded the third star in 2005 and has retained it since then. So what keeps him motivated? “You need to work at 300 per cent every day, each day. You need to always try and improve, create new things. In a restaurant there are a lot of elements which are important. There is the ambiance, the food and the staff who work here. You need to motivate them on a daily basis, to brief and debrief them everyday. If you let go even for a few days, the level goes down immediately. It is this you need to avoid,” he tells me. But how difficult is it to remain motivated, I ask. “Motivation is not difficult to find if you love your job. We work 16 to 18 hours a day. For example, yesterday I left here at 12.30am and this morning I was already here at 8am. At home you do just one thing which is sleep,” he tells me. In his case, he has been lucky to have the support of his wife. “We have been here together. It is also important to get to know our clients, to know what they want and like. My wife is there to motivate the staff every day in the front of house. You find the motivation when your customers leave the restaurant and tell you that they have eaten extremely well or had a great evening. It is this which gives you the energy to continue,” the chef of Hof van Cleve tells me. So what are his goals now? He tells me that he is happy with what he has achieved and has no further ambition other than to keep the same level. “Maybe I want to have more time for my family in future because all I have done in the past is work. I also want to remain where I am at the moment. Because to arrive is one thing but to remain there is another. So we need to continue to put the effort to keep our level,” he tells me. Goossens has five principles which are followed religiously at Hof van Cleve. “We start first with the produce. The selection of the produce is a crucial part of the process. We then need to work on cooking the produce and finding the best way to get the best out of the produce. The sauce or ‘jus’ is the third element and is used to boost the flavours of the produce. What follows is the garnish. We decide on the garnish and the texture, whether it should be crunchy or creamy for example. We then end with the presentation which is important but is the last point. We don’t start from how the dish should look but rather from the ingredients. This is the principle of our cooking,” he says. Like Italians, the Belgians have the culture of ‘la mamma’. “France also has this culture but looking at Belgium, the reason why we cook a lot with vegetables is historic. In the past, everyone had their own garden patch. We had nothing else so we needed to do a lot of things with them. There were no fridges in the past. A lot of our gastronomy comes from here,” he says. He learnt his trade under some of the top French masters but he tells me that it was not easy. “It was the ‘grand cuisine’ with rigid rules. If you did not follow the rules, they kicked you out. Things have changed completely nowadays. If we do today what was done 30 years ago, they would send us to prison,” he tells me. Goossens has passed his knowledge and experience to many Belgian chefs. “We have many great young chefs in Belgium. I am pleased that we have also helped in the formation of many chefs. Some time ago we made a list and we counted over 200 chefs who have worked here. 70 of them have their own restaurant.” When I asked him about the upcoming Belgian chefs, he tells me there are many. But he did mention his sous-chef Martin who will be opening a restaurant at the beginning of next year, Michael Vrijmoed and Tim Boury. At 51, Goossens is probably still reaching the pinnacle of his career despite dropping off from the top 50 World’s Best list (he is in 54th position). That is evident from a recent review on Elizabeth on Food who gave him a perfect score (100) saying that the marriage of modernity and classicism is so perfect that one cannot help but feel that Goossens has taken the maxim of Coco Chanel to heart: “Innovation! One cannot be forever innovating. I want to create classics”. Goossens’ restaurant Hof van Cleve is in western Belgium in the countryside near the town of Kruishoutem. Next: Don’t miss our short question and answer session with Peter Goossens. We will touch upon issues like food waste, food guides, social media, food bloggers, paying in advance in restaurants, his favourite cuisine, what he cooks at home, what he does not eat. Clearly somebody, and not the least, is aware of what’s going on in Belgium now, however things may have been 35 years ago.